I started woodworking around 2009 almost by coincidence after we transformed a cow stable into a machine hangar, this left us with a mountain of pine beams from the 512 m2 floor we took out (about 5500 sqft) . 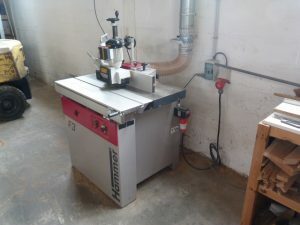 I started trying to make all sorts of stuff with all that wood, and soon bought my very first wood working machine, an old Kity 616 combination machine that I found on ebay for about €600, it had a central 220v motor that you would connect to the table saw, jointer/planer or spindle moulder with a belt. 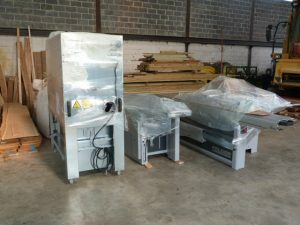 Up to then I had never really worked with stationary woodworking machines, this opened a whole new world of possibilities for me but I had to learn everything from scratch using books and videos. 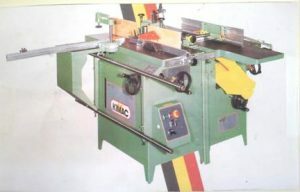 The second year I started looking for heavier equipment, that’s when I bought a used set of separate “Kimac” saw/shaper and jointer/planer machines on 380V for about €1700. For me this was a giant leap forward in terms of capacity. 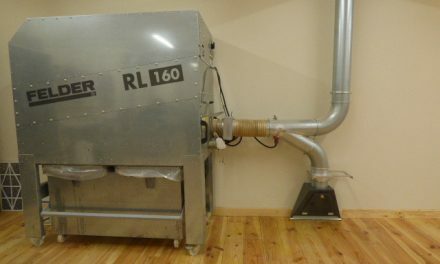 It had been bought for a woodworking student by his parents, but he hardly ever used it, the plastic protection film was still present on some parts. 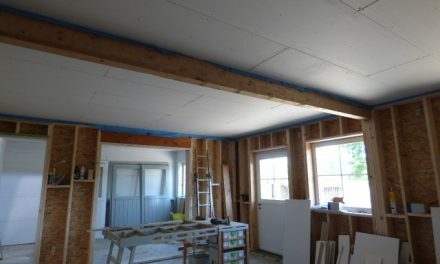 Soon it also became clear that I couldn’t do much proper woodworking without being able to control the temperature and humidity, so I closed off the shop corner where I did assembly work with framed insulated walls, article here. This was paradise for me, I could work in a comfortable environment all year around in a clean, bright and well lit shop. 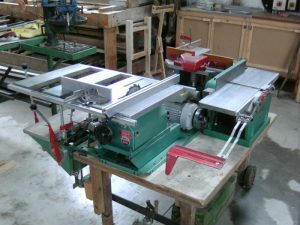 Around 2011 I was following an evening school course in woodworking to obtain a recognized degree, that’s also when it became clear I had to upgrade to higher level machines, especially in a table saw that could handle panels, if I wanted to become a professional woodworker. 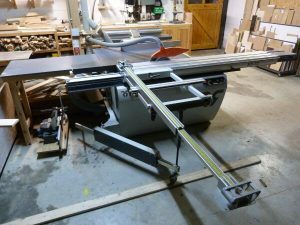 So with the help of my parents, who wanted to support me, I bought a Robland NXTZ panel saw with shaper and 2500mm sliding table, and a 300mm NXSD jointer/planer. 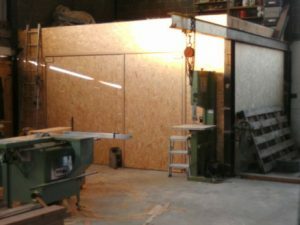 Having a panel saw was a major change, up to then I had all my panels cut at the lumber yard, precision was very approximative. This allowed me to cut everything myself. people often ask me what I think of these and why I changed, basically they are extremely good quality for the price, I worked professionally with them for 2 years and could do anything I wanted. You can see these in my first youtube videos on my channel. There is nothing really bad to say about them, besides maybe a few plastic knobs here and there that were fragile. 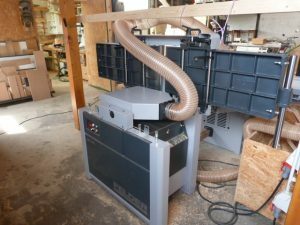 A year later I invested in a separate Hammer F3 shaper, and installed a power feeder. Up to then my shaper was combined into the panel saw which required you to mount and dismount the cutters and fence (which was very heavy). Working like that requires a good organisation, you have to be sure all your parts are cut before doing the shaping, and sometimes you ruin a part during the shaping and have to take down the whole system and lose the settings… That’s why I invested in a separate shaper, the power feeder also allows for much more consistent and accurate cuts as the feeding is regular, while when using you hands to push through, your pressure and speed isn’t linear and this shows on the work piece. 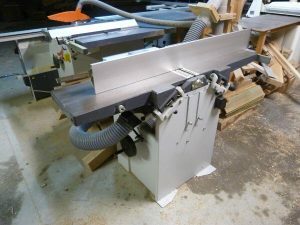 That’s when I made the choice to order the machines of my dreams, a Felder K700s panel saw, AD741 jointer/planer and RL160 dust collector. 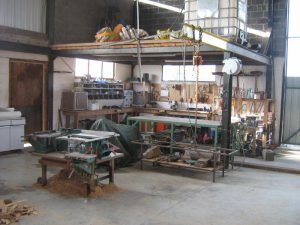 This made it necessary to rework the space dedicated to my stationary machines, I built a floor above the machines and stored the dust collector on that floor. 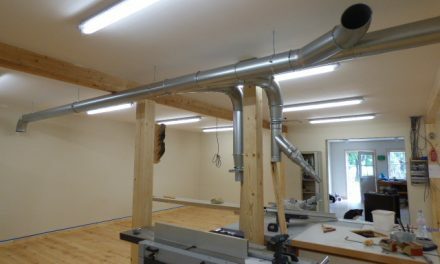 This also made it easier to have proper lighting above the machines and install proper dust collection tubing. The next year I invested in an Aigner safety fence for the shaper, this fence costs over €1000 but it’s a major improvement in safety and practicality. Because you can create a continuous fence around the cutter, this prevents the work piece from being pulled into the fence. But when it arrived I found out that this was not compatible with the Hammer F3 despite the salesman telling me it was. After leaving this piece of wonderful equipment in it’s box for months I resorted to ordering a Felder F700z shaper to replace the Hammer, otherwise I think I would have kept the Hammer. 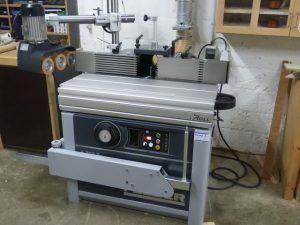 This Felder however has an electronic height adjustment which makes working with it incredibly precise, without this you have to make numerous test cuts and measures, I couldn’t do without any more. This was basically the last work shop change before I started building a completely closed off work shop on the other end of the hangar, which is my current work shop. 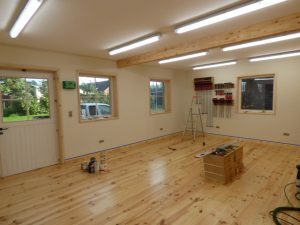 My previous 4x5m assembly room (13x16ft) was simply too small and often cramped with furniture. Usually when a piece of furniture was finished I had to transport it to my parent’s living room 2 km away and store them there. In the hangar the finish would be ruined by the humidity. Below is my old work shop assembly room on a normal work day, the free concrete floor in the middle is literally the only free space I had. 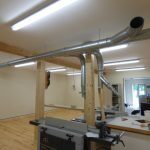 I love your shop you work very efficiently, what brand of dust collection piping did you use in your new shop. it looks well made. Thanks Josh, my new shop has proper piping from Ducomat.com I believe the brand is Schüko, but I’m not 100% sure. Some elements are from Felder, they are compatible. Thanks, I was thinking of buying a traditional cabinet saw untill I seen you use a panel saw, how is the quality of the felder saw it looks well made, is it holding up well for you? What options are must haves. 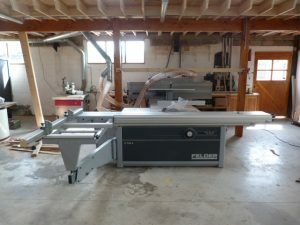 The Felder 700 range is mid range in terms of European panel saws, for me as a more traditional cabinet maker it’s great, but you have panel saws that cost 4 times as much. But those are more for the kitchen industry, fully automatic. The advantage of Felder is the dado cutter, it’s the only saw here that can legally have that option, it’s a must. Otherwise a slider 2500mm is a minimum requirement, mine is 3200mm. And a parallel guide that goes to 1200mm wide. And obviously a scoring blade is a must as well. Mine is doing just fine, I can see myself keeping this one my whole career. That’s awesome, what do you mean dado is illegal there? Saws here need to brake and stop the blade within 10 seconds, dado stacks are so heavy that they could keep spinning individually, or even undo the arbour bolt when braked so rapidly. That is why they are not allowed here in the way they are used in the US. Felder made special cutters that fit and lock onto the arbour, they cant spin on the arbour because of two rods that go through them. So they can’t transfer any energy to the bolt when braked. Otherwise they’d come flying of eventually. 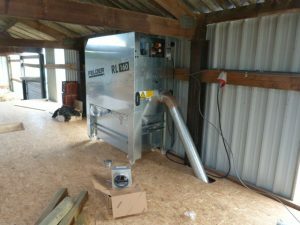 do you think you would have been a little happy with a combo machine?what is the dimension of your new shop? As you can see I went from full combo, to saw-shaper and jointer-planer separated, up to now where my saw and shaper are separated as well. Combo machines are great when space and budget is limited, but they are obviously less practical. That is why I gradually moved away from them, even if my jointer-planer are still combined. That combination bothers me the less and I don’t really have the room to separate them. 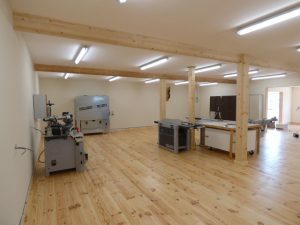 My new shop is about 11x15m, the machine room is 11x10m. 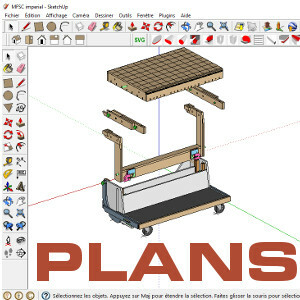 Just wanted to compliment you on what you do, things you’ve made so far… I was just watching your youtube video of your MFSC cart and very impressed with it’s functionality. Great job Timothy ! I’ve followed you for a long time and bought your plans even though I have zero chance of building anything (i wanted to support you) living in inner city Sydney. 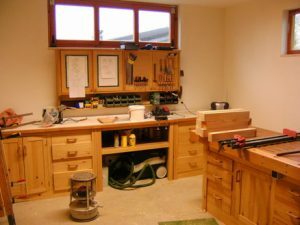 My woodworking dreams live vicariously through you so please keep posting videos! Thanks for the support, it certainly helps me to continue. Hi Timothy, your both story and workshop are so inspiring. I’m curious how many people you employ to run the business/production? Really appreciate your approach, it is a pleasure to see you contributing to ww community, sharing your knowledge, making it growing. Wish you all the best on the way to your goals (whatever they are)! Hi Denis, I work all alone which is a deliberate choice. I don’t want the stress of having employees and I don’t think I would be able to do all this either. But thanks for the kind words. I’ve been ploughing through woodworking videos on youtube the last year and today discovered you (through Matthias Wandel), and was amazed by your designs and inspired by your story! 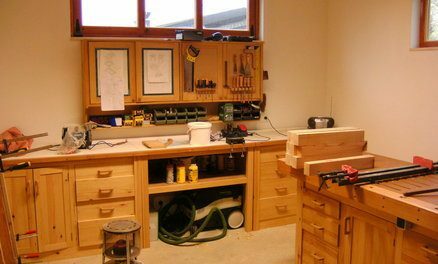 I’m just getting started in woodworking and mostly work with hand tools, but hope to some day have a proper shop. I just wanted to applaud your work, and I’ll be binging the rest of your channel soon! I’ve been enjoying your YouTube vids for a while as I’m going throw the same process as yourself setting up a woodworking business on my own. 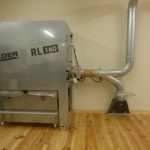 When I saw your latest shop and machines I felt a world away from being able to achieve the same results but coming to the web site and seeing your humble beings really fills me with hope for future with dedication and hard work I also dream of working with felder. I’ve also brought the plans for the mfsc great design was surprised it didn’t cost more with the effort you’ve gone through in design and bring it together. 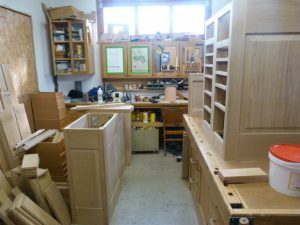 So I am just about to start the journey of refitting my home shop with your cabinets. The ply panels arrived yesterday and I have a months holiday ahead to build 3 of your benches, storage cabinet, tool cabinet and a MFTC. I’ll keep you posted with some pictures as the project moves along. Thanks so much for such a comprehensive set of plans, worth every cent. please do share pictures each time you finished an element. Looking forward to it. Your story of your path to the new shop is amazing. Please tell us what yourday time job is so to speak – what do you bui;ld and who are your customers – e.g what is your market so to speak? I build furniture for goldsmiths and watchmakers nearly exclusively, it’s a very small niche market. Your projects and woodshop are amazing!!! Congrats!!! 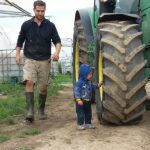 Great story.. very inspiring to me given where I am in my second career as a full-time woodworker and aspiring custom furniture maker. I hope to expand to a bigger shop (currently in the basement of my house). Cheers!